Selecting the best dog bed for your best friend may seem like an easy task, but with all of the options currently available, you may seem lost in the process. These products can vary greatly in size, comfort level, and style. If your dog is large, you’re probably going to be looking for a bed that is larger in size, featuring a high level of cushion to support extra weight. If your dog is a smaller breed, perhaps a sleeker design may be the right fit for you and your loved one. 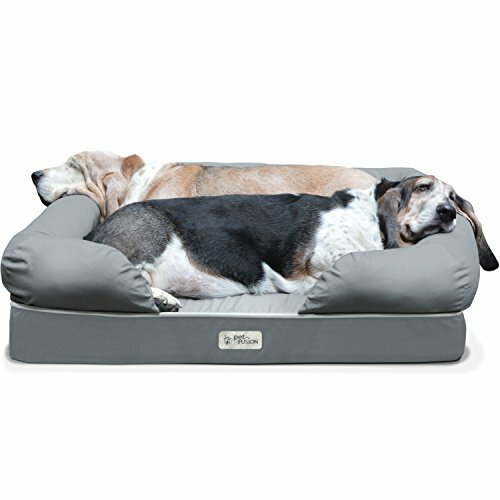 Alternatively, if you have two or more dogs (and they enjoy sharing the same bed), you’ll want a dog bed that is large and comfortable enough to support them both. We’ve selected the top 10 best dogs best on the market in order to help make this decision easy. This bed is packed full of features, and comes in a three available sizes: small, large, and extra large. The cover is fit with a polyester and cotton mix, providing a stylish appeal for your home. The PetFusion comes in two available colors, slate-gray and brown. The product is designed with premium components, including a solid 4 inch memory foam base for overall comfort and joint support. With a water and tear resistant cover, you won’t have to worry much if your dog has an accident. This cover allows for a slow rate of absorption, giving you time to clean up any messes that may occur. If your dog is prone to scratching or biting, the tear resistant material will reduce the amount of overall damage that your dog can do. This bed also comes with a non-skid bottom, so it’ll stay in place if your pet is active and likes to play. The large-sized variant is perfect for medium to large sized dogs, or multiple pets – it can easily hold over 100 pounds. The cover is also removable and machine washable, allowing for easy cleaning when your dog makes a mess. This affordable pet bed is large in size, and can hold weight up to 100 pounds. The cot-like design measures at 51 x 31.5 x 8 inches. It features a unique, elevated steel frame to maximize the breathability and overall air flow. The HDPE mesh fabric allows air to flow through and around the bed, cooling your pet while it’s laying down. 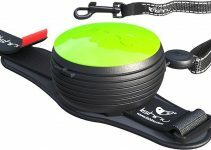 The frame is made from powder-coated lightweight steel, giving the elevated support your dog needs while providing the strength to support heavier weight. It also comes with non-slip rubber feet, so your pet won’t be sliding this bed around easily. Assembling this bed is simple, requiring only a screwdriver. It can be used outdoors as well, allowing your dog to relax in the sun while keeping cool in the process. 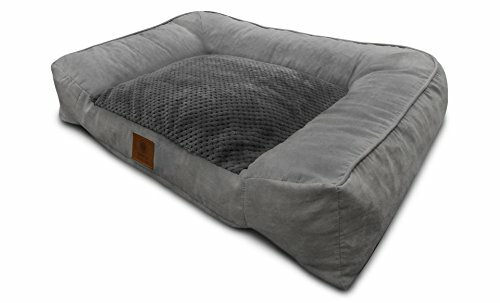 Available in a wide variety of sizes and colors, this dog bed has plenty of options at a low price. 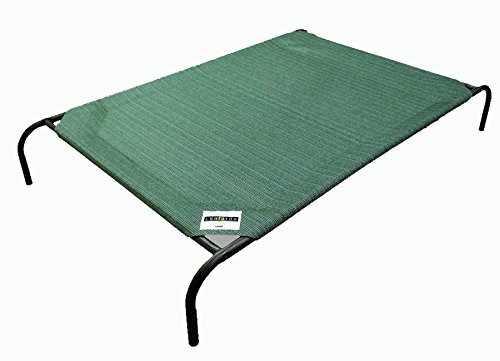 With multiple sizes available (from extra-small to 48 inches in length), it is suitable for laying inside of dog crates and cages. It also functions great as a standalone bed, seamlessly blending in with your home decor. The covering is made from synthetic fur, giving maximum comfort for your dog while remaining stylish. Its bottom includes a non-skid bottom, making this bed perfect for hardwood, tile, and other slippery floors. This bed is perfect for dogs between 91-100 pounds. It is also machine washable, giving you an easy clean-up and maintenance schedule. If you want comfort, style, and mobility, this bed may be a perfect fit for your and your pet. It comes with a one-year manufacturer warranty as well, so you won’t have to worry if you run into any issues with the build quality. This pet bed is available in many sizes, styles, and colors, giving you many options to integrate it into your home decor. Available in sizes from small to jumbo, you’ll be able to select a correct fit for your dog whether you own a Yorkie or Great Dane. Its orthopedic design promotes better health for your dog, supporting joints so that your pet can get relaxing sleep. The plush synthetic fur cover is soft and comfortable, ensuring that the surface will be soft on your dog’s nose and paws. The cover is also zippered, and can be removed easily for machine washing. It is also water-resistant, so clean up will be easy when your dog makes a mess. If you’re looking for a simple and sleek design that will provide your pet with maximum comfort, this bed may be the perfect fit for you. With the American Kennel Club brand associated, it’s no wonder why we included this bed on our list. The AKC is a well-known registry for purebred dogs, with a stellar worldwide reputation. This design incorporates a plush and cozy feel, in a round form. 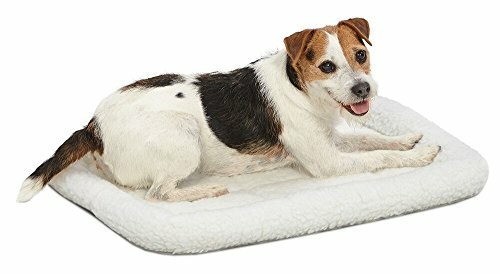 It is a smaller bed, suitable for dogs up to 25 pounds. It is 22 x 6 inches in size. This bed is soft and comfortable, and is made out of 100% polyester. This allows you to machine wash the entire bed without any removal of components, as long as you remember to set the wash on cold, and tumble dry it on a low setting. 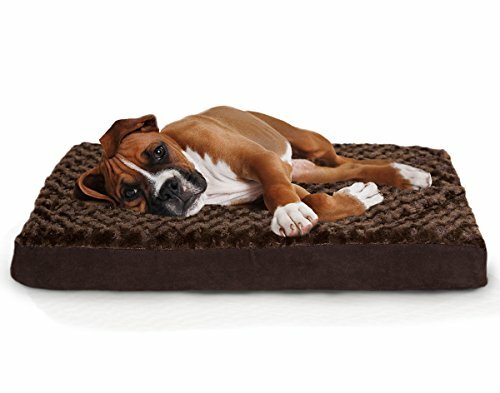 With the weight capacity of 25 pounds, this dog bed would be best used for small to medium sized pets, or two toy-sized dogs. If you have ever shopped for a bed of your own, you’ve probably heard of the Serta brand. Serta is a well-known mattress manufacturer, and are considered a top mattress maker. This quilted couch bed includes a premium design that is fit for comfort, backed by the Serta brand. This bed is available in three colors: blue, mocha, and tan. It comes in one size, 34 x 24 x 4 inches. It features a 4 inch layer of Serta’s advanced Orthopedic Egg Crate Foam, maximizing pressure relief for joints. The attached bolster gives a unique couch-like design, while providing extra support for your dog’s head and neck. The fiber cover includes a zipper, making it easily removable for machine washing or laundering. Featuring ultra plush memory foam material, this AKC brand sofa bed is perfect for your dog seeking complete comfort. This foam provides full support for your dog’s hips and joints. It is also made from recycled materials, so it’s eco-friendly. Its bottom features a non-skid bottom, so resting it on hardwood floors, laminate, or tile won’t be an issue. Available in one extra-large size, this bed will be a great fit for your dog regardless of weight. It’s big enough to allow for two small dogs, as well. This bed looks great, and is available in three colors: gray, brown, and tan. If you’re looking for a large, comfortable bed for your dog(s) that will look fantastic in your home, look no further. The American Society for the Prevention of Cruelty to Animals is a well-known organization dedicated to preventing animal cruelty. 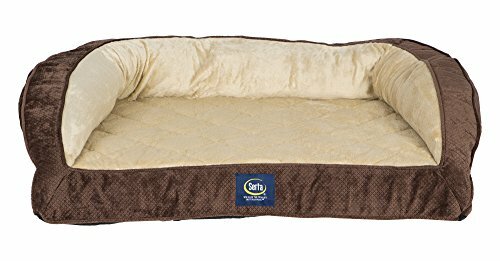 With the ASPCA backing this dog bed, you’ll feel assured when selecting this product for your smaller sized dog. It comes in one size, 28 x 20 x 8 inches, perfect small to medium-sized breeds. This bed is available in a few unique colors and styles: solid blue, brown-striped, and gray/blue-striped patterns. It is made of 100% polyester, and features a plush, synthetic fiber top. This provides a soft and cozy feel for your pets, while being completely machine washable. Keep in mind that if and when you decide to wash this bed, you’ll want to set it on cold, and tumble dry it on a low setting. With the reputation and build quality of the American Kennel Club, it’s not surprising that this brand has made our list several times. 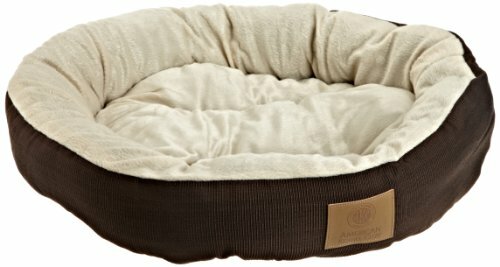 This bed features a plush design, and is well-fitted for a high level of comfort for your dog (at an affordable price). It is available in three colors: burgundy, gray, and taupe. It is available in one size, 25 x 21 x 8 inches. This form will easily fit a smaller-sized pet. It has an orthopedic bottom, giving your dog a high level of comfort while resting. With it’s non-skid bottom, you won’t have to worry about this bed sliding on slick surfaces, like hardwood flooring. The entire bed can be machine washed, as long as it’s set on cold water and tumble-dried on low. 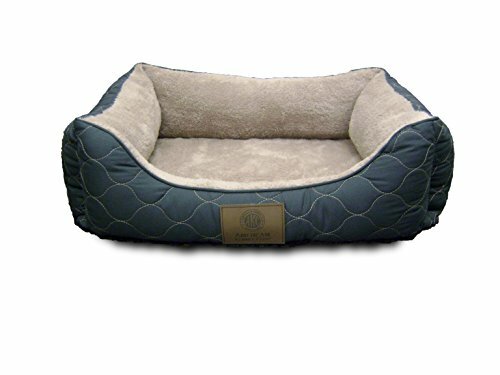 At a very affordable price, this dog bed includes a variety of features, sizes, and colors available to choose from. Sizing options range 18 to 54 inches in length, making this bed a perfect fit for toy breed up to large-sized dogs. It features a soft, synthetic fur, and has a large padded polyester, intended to give your dog’s head extra support. This bed comes in five different colors to choose from as well. The bed can be fit into crates, so if you’re travelling or have your dog crate sitting indoors, your pet can still be comfortable while secure. While it’s an ideal solution for making a crate or dog house more comfortable, it can just as easily be laid on any home floor. It is also completely machine washable, and can be placed in the dryer as well. This bed comes with a one year manufacturer’s warranty.